To avoid peanuts or peanut butter, try this stir fry with sunflower seeds or sunflower seed butter. Bring 4 cups water to boil in a 2 to 3 quart saucepan. Add noodles, cover, and remove from heat (do not add flavor packets). Wait one minute, drain noodles and set aside. In a small saucepan, combine peanut butter, soy sauce, and 1/2 cup water. Heat over low heat, stirring until smooth. Remove from heat. Heat oil in a large skillet over medium-high heat (350 degrees in an electric skillet). Add chicken and cook until no longer pink when cut, about 3 to 5 minutes. Add red pepper, ginger, and carrots and cook for 2 to 3 minutes. Add cabbage and cook 3 to 4 minutes or until cabbage is crisp-tender. 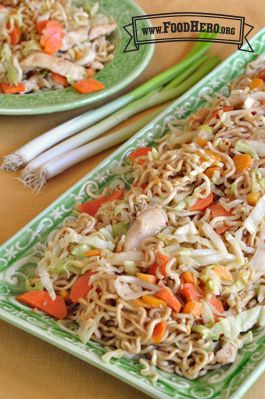 Stir in green onions, cooked noodles and peanut sauce. Toss and serve immediately. 4 Comments for "Mo (moo) Indonesian Stir-Fry"
We make this recipe at home all the time and love it. I use a lot more veggies based on what we have at the moment, but some favorites are bell peppers, onion, cabbage, carrots, peas, and water chestnuts. I've also made this vegetarian by using tofu, and we use rice noodles and gluten free soy sauce due to Celiac's disease. Love this recipe! Great recipe, lots of "zing" with the red pepper. I cooked the ramen as directed, but rinsed it immediately -- reducing the fat in the recipe a bit. I will try this with tofu next time too -- not that the chicken wasn't excellent with it, but just for fun. LOVE!!! So great tasting, quick to make, and adaptable - we made it vegetarian! One change we made was to use Udon noodles instead of ramen (they are located often near the tofu in grocery stores in the produce section) which are thicker, fresh noodles. We used 2 packets which was the same ounces as it called for of tofu. And we pre-cooked them just as it said to do with the Ramen. Also we did top the recipe upon serving with hot chili sauce and then our family favs "seaweed sprinkles" which can be found at Asian market (we use furikake brand which is marketed as "rice seasoning"). I also don't like cooked carrots so instead of them we used the same amount of broccoli. In the end the dish tasted a bit like Pad Thai which made me think you could cook an egg scrambled into it and even top with some crushed peanuts. Oh, and we used extra-firm tofu instead of chicken, one container of it. I love this recipe! I would suggest using crunchy peanut butter!